The Amazing Book of LEGO Star Wars is a bit of a strange release. You could be mistaken for thinking this is a lavish sales brochure; a promotional item given out to those who are collecting LEGO Star Wars toys. And in some respect you'd be right. 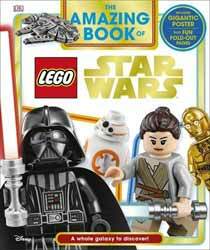 But, for young (and not so young) collectors, this book offers the chance to see all of the LEGO Star Wars toys that are currently in circulation. For those in the know, this is important, as LEGO have a policy of discontinuing its ranges after a few years and so this book shows the very latest range. This hardback book appears quite thick on the outside, but once you open it you realise there's very little in the way of pages (there's actually only 50). The pull here is the large Millennium Falcon (a slightly modified version to the one that was released a few years ago). It's the one from Star Wars: Episode VII - The Force Awakens, and features an older Han and Chewie as well as Finn, Rey, BB-8, Tasu Leech and another member of the Kanjikub who for some reason doesn't feature in the book. There's a giant poster (which is housed in an envelope at the start of the book). This shows the Millennium Falcon with its top segments opened so that you can see the inside. The pages of the book also have fold-out flaps that reveal more figures and vehicles. Some of these are small fold-outs, while others are full-page. This is by no means an essential purchase, and some may even feel conned into buying a sales brochure. But for LEGO Star Wars fans that want a handy, well produced souvenir of all of the current toys available in the range at present, this is an invaluable guide.